So, as it turns out, there seems to be a reason why The Battle of Ranskoor Av Kolos didn't feel like a finale for the new season and it seems to be because they decided to save everything for this New-Years' Day special, Resolution. In fact, Resolution seems to tie up all the narrative threads left hanging from the previous ten episodes, in particular how Ryan deals with his father and finally giving this new incarnation Doctor a big battle to round out one year and kick off the new one. It is also funny that while Chris Chibnal didn't lie about the fact there will be no returning monsters in this new series, he did keep it secret that we would have to only wait for the 1st of January to see the Daleks returning. For me, you don't get to see what a new Doctor is really made of until they come up against those genocidal pepper-pots and as a result, Jodie Whittaker gets to end her first season as the Doctor on a real high, battling her biggest and oldest foe while celebrating a brand-new year. Resolution also has to offer a much more cinematic approach than the story and much of the season that had proceeded it, even if it doesn't have the same emotional resonance that the previous outing had. In fact, it almost feels like a completely different series, thanks in part to the Dalek-half of the episode, which is a rollicking great adventure set, naturally, in Sheffield. Chibnal sets the episode's emotional half around the return of Ryan's Dad, Aaron, who shows up on New-Years' Day hoping to turn over a new leaf with his son. Almost in the most literal sense of the word, it is a episode of two halves that make a great whole, even if there isn't a lot of cohesion between the two. But at least Aaron's arrival gives the episode more a reason to split the TARDIS gang up in a better way than we have gotten this series. Apart from Brexit having disbanded UNIT for the time being, there isn't really much to the Dalek part of the episode. It is just the Daleks being the Daleks and the Doctor having to stop them. But what this half of the story lacks in imagination, it more than makes up for in originality. All the Dalek stories from the show's long history have re-used ideas or re-made them, but Resolution found some rather enjoyable and lovely ways to reuse them all. What helps is that this is a type of Dalek we have never met before, a reconnaissance scout, some of the earliest Daleks to leave Skaro when the Daleks decided to go out and exterminate the universe. This Dalek found itself on Earth in the 9th Century and was defeated by the opposing forces at the time. Dismembered at spread across the entire globe, this Dalek lay dormant until two lovelorn archaeologists discovered it under the town hall in Sheffield. The opening scene and monologue is just one of the moments where director, Wayne Yip decides to show off the dramatic movie-like qualities of this special episode. Whereas The Battle of Ranskor Av Kolos and most of series 11 decided to go at a walking pace rather than a run, Resolution is the other-way-around, and running at a zippier pace than usual, Resolution ends up showing us the Daleks at their best since 2008. Before it can rebuild itself from spare parts, the Dalek in its squid-like form takes over the mind of one of the archaeologists and uses her as a puppet for its evil plans. Yip makes sure he directs that with an element of horror and plenty of action, which he manages to keep going when the Dalek finally takes on its new form. In its new waist-clenching form it takes an entire army platoon and a tank in open combat. With their bulky designs and voices, the Daleks can sometimes come across as a little silly but the sight of the Dalek battling the military is another reminder than the Daleks are one of the deadliest creatures in existence. 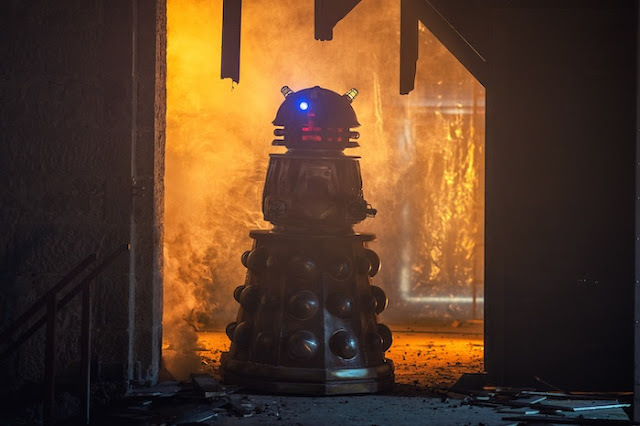 If there is anything that the modern era of Doctor Who has proven it is that the Daleks are often at their most interesting and deadliest when there is only one, alone and struggling to survive and Resolution proves itself smart enough to keep the focus on just one of them rather than an entire battle fleet. It also helps that we've not had a Dalek centred-episode in a long time. They haven't really been the focus of attention since 2015 with The Magician's Apprentice/The Witch's Familiar. But even that story focused on Davros, so you have to go back to 2014's Into the Dalek to find one completely focused on them! 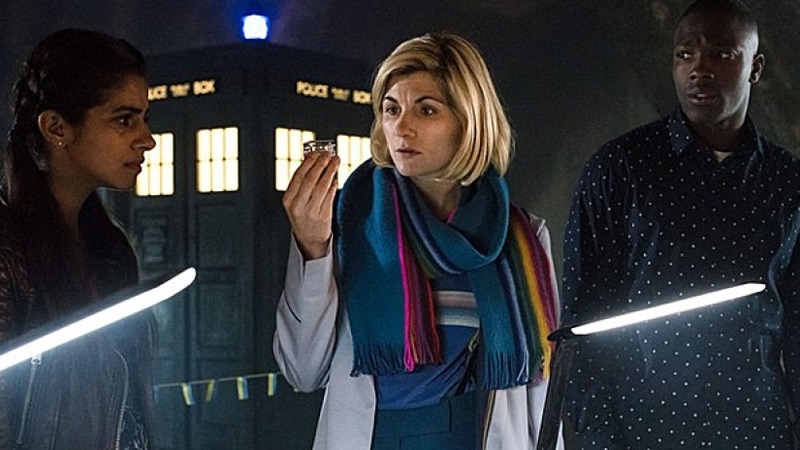 It is true that absence makes the heart grow fonder and I was ready for them to return and keeping them clear of series 11 and instead making them the villain of a special episode was an intelligent move from Chris Chibnall, even if much of his handling of the previous season wasn't. With the Dalek giving us some action, all the material between Aaron and Ryan gives us a chance to get some character. It is a fairly straight forward story about an absentee parent trying to get back into their child's life, but there are some rich elements elevated by the strong performances from Daniel Adegboyega, Bradley Walsh and Tosin Cole. One of the best scenes here is between Aaron and Ryan in a tense chat in a café. Ryan lays out the type of apology he wants, while his father struggles to explain the reason he was away. Really it is a scene which shows us how much Ryan has grown since we first met him and it is clear how much more confident he has gotten since he began travelling with the TARDIS crew, speaking openly, unapologetically and honestly about his feelings. As the episode picks up momentum, the action sweeps up Aaron and his engineering skills finally start to come in handy, turning his oven/microwave into a device to stop the Dalek. However, the loose Dalek manages to take over Aaron and it is up to Ryan to save his father in the final moments. However, both resolutions to this story are handled and wrapped up a little too quickly, especially the storyline about Ryan and Aaron. But this plot point is also a metaphor as Ryan saving his father is about how far he would go to recapture his relationship with his dad. Previously, I hadn't thought about this series being about Ryan trying to grow into a man but now, knowing this, it is one of the series' strongest storylines overall. It seems like I am giving this episode a little too much praise, there is still some issues with it. The archaeologists Lin and Mitch are really underused, even if Charlotte Ritchie puts in a fantastic performance as Lin. And speaking of being underused, poor Mandip Gill has been sidelined again as Yaz. She is hardly in it and it seems that Chibnall just doesn't know what to do with her. And there is the usual Chibnall issues on display here too, ones that become more obvious when you think about it, not when first watch it. Thankfully though, Resolution is saved by its strong execution. Wayne Yip is fantastic in the director's chair here. There is a pace and energy that was on display here that has been missing throughout the entirety of series 11. 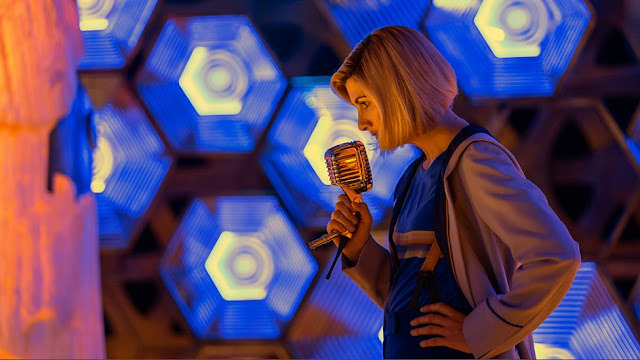 And Resolution is a particularly strong episode for the Doctor who continues her proactive attitude she has developed over the course of the second-half of her opening series. She openly tells off Aaron for the mistakes he has made in his life, reaches out to Lin when she has been taken over, runs around like an action hero and most importantly, stands up to the Dalek. It is a fantastic performance from Jodie Whittaker but Resolution is ultimately about a team of people having to work together, much as they did in the 9th century to defeat an ancient evil. And it more than proves that this Doctor is capable of standing up to the Daleks!